All the people ate and were filled. And there was much food left. Twelve baskets were filled with the pieces of food that were not eaten. Our story began with Jesus telling his disciples to feed the 5,000 themselves. "Impossible!" was their reply. Yet when all is said and done, the 12 apostles picked up twelve baskets of leftovers. Each of them got to hold the miracle in their hands. Jesus didn't want a single apostle to miss the point. 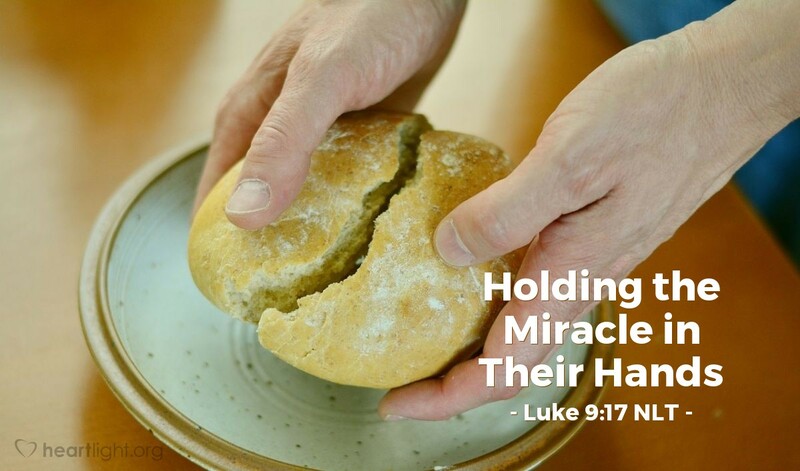 (He doesn't want us to miss the point either: when Jesus blesses our efforts, he can do incredible, wondrous, and miraculous things through us even if what we bring him is small.) Jesus was preparing them for what would follow in their ministry. One day soon, Jesus would not be physically present to help them, yet they would be called to do the impossible. He wants them to know that with his blessing, they can do it. And, as you're reading this, you are living testimony that they did do it. Now he wants you and me to believe the same thing. If we will offer what we have to Jesus for him to bless and use, he can do incredible and miraculous things. The issue isn't one of Jesus' power, but of our willingness to bring him what we have and who we are. Father, thank you for the twelve baskets of leftovers. As I offer myself to your service, please use me to bring you glory in big or small ways. Selfishly, dear Father, I ask that occasionally you let me find a "basketful of leftovers" to remind of your powerful work. However, please help me serve you faithfully even if I never get to hold those "leftovers" in my hand. In Jesus' name. Amen.